Welcome to the website of our British shorthair cattery registered in Cat Club Łódź (CCL) in Łódź, which is a member of the international organisation FIFE. Our adventure with British shorthair cats started in 2002. We have chosen British shorthair cats, because they bewitched us by their wonderful character and muscular body type. Most of our cats were imported from the best British shorthair catteries in Europe. Today we have seven British shorthair cats in our cattery. Five females and two males, cream Whisky and red Ilias imported from German catteries, their ancestors being cats from the best British shorthair lines. Some of our cats have been appreciated by foreign breeders and they currently live in such countries as Germany, Hungary, Russia and Lithuania. 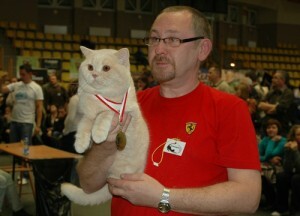 The cats from our cattery attend and are successful at shows both in Poland and abroad. You can see more by visiting our website.